Darr asked me on discord to necro this thread. One of the above values is incorrect. Whaddya waitin’ for kiddo? Go figure out which one it is! 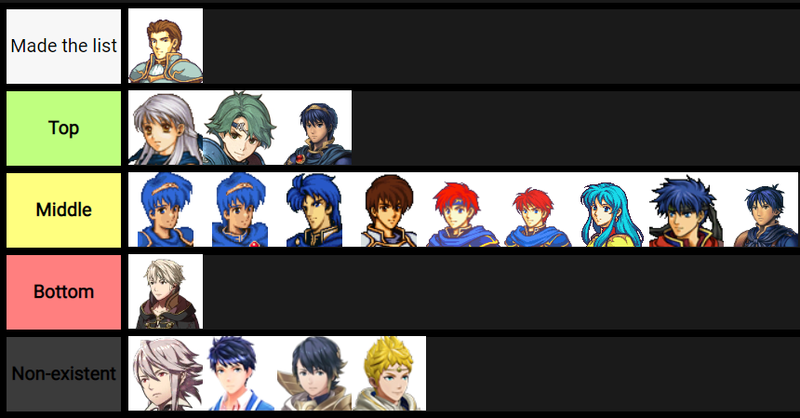 Fire emblem games I have played Tier list. You’ve got Tellus but where’s Rogers? What better excuse to bump the oldest thread on Fire Emblem Universe? Text based tiers? Now it’s time for picture tiers! Let’s use the original tier list, and by extension first post of FEU, as an example. Et voila, now updated to 2019 standards. Alfonse is a fine lad. He deserves much higher.